This entry was posted in Author: Shakespeare, My Shakespeare Project by cleopatra. Bookmark the permalink. Why don't you join? I haven't put a finish date on the project, so, as I said, no pressure. Thanks so much for the info about old/new English editons online. I will look at them today! This is awesome! Good luck with that! Initially I used the No Fear editions; I would read the "real" version, but if I got stuck, I used the modern English as "translation" I like the No Fear editions because sometimes it's not only the word that's the issue, but the context. After reading a few plays from No Fear, I didn't need any more "hand-holding" and now, after reading a number of editions, I prefer the RSC (Royal Shakespeare Company) editions. I did try the Folger but at the moment I can't remember why I preferred a couple of other editions over them. I think Folger are the ones that are touted for students, right? I will absolutely check out your Shakespeare tips! Heading over there now! Oh I DO think I've seen the RSC versions. They aren't bad, but I just haven't had a chance to actually read from them. My Shakespeare teacher from when I was eleven (the one I mention in the post) used the Folgers, so that's why I'm so hooked on them. If you're a Shakespeare buff, you may enjoy William Hazlitt's commentaries and I also really enjoyed Oliphant Smeaton's Shakespeare His Life and Work. The first is early 19th century and the second early 20th century. I've added a link to your tips in this post. You touched on techniques to aid in understanding that were so helpful. Thanks, Sophia! Thanks, I think I'll need it! Now I just need to get focused. 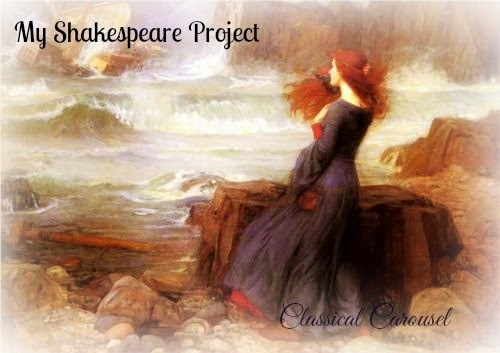 Ooh, a Shakespeare project, fun! I have a long-term goal of making it through his complete works, though I'm afraid it's been a while since I've made any progress (and that's despite creating it as a project of my own). I do prefer low-stress, no deadline projects, though. I think reading's more fun that way. Enjoy! I think if you've made the effort to start the project, if you take a break, it's fine. It's always there for you to get back to one day. Now I just have to start mine to give myself some momentum! I'm little bit scared of Shakespeare. I only put 1 of his plays on spin # 8. His language is beautiful, mysterious…and far too big to handle for me without some preparation. I like what Homer said: "Avoid it; for this is the hardest month, wintry, hard for sheep and hard for men." They aren't the easiest read but the plays aren't lengthy so you'd only have to devote a short, intense period to one. I don't think you have to do any prep though, just get yourself a good edition that explains things as you go. Once you get reading, they get easier and easier. He's a master of the ins and outs of human nature and really leave you hanging as to motivations. There often could be many and, being me, I can get frustrated wondering why. It's been 30 years since I left High School, but I still detest reading Shakespeare. I had 3 years of reading. discussing and analysing MACBETH. So now I hate that play. But I am more than happy to read any books on the Shakespeare Authorship debate!! I still have not made my decision about who really wrote the plays, but I do concede that it was NOT William Shakespeare!!! MAybe I can do a challenge on that – read all the books out there on this debate. That's a great idea!!! That's too bad, Francesca. While I think some of the plays are weaker, some are just excellent. I can't believe the depth to Hamlet, and Othello was another one that blew me away. I haven't read much specifically on the debate, but I have read different scholarly books on Shakespeare. I believe the first time his authorship was questioned, it was as a joke and the trend got taken up from there. My question is, "does it really matter?" There is very little we know for sure about many events in history. There are always differing points of view and different perspectives. Anyone who wants to know something "for a fact" will often be disappointed. I think the tragedy of some certain historians is that they present their views as fact and therefore, as readers, we think that we can know for sure. But if you read more balanced historians, they will say for example, "these are three possibilities. We think it's the first, but we can't be certain because of ABC" So to try to find "the truth" is often a exercise in futility. Using evidence, we can guess with a reasonable certainty, but often, that's it. For me, his plays are brilliant, whoever wrote them, and I appreciate them. I've never understood why people who are so far removed an event, can claim to know more about it than people closer to the event, but I assume with some authors, that whenever they can stir up controversy, there is more likelihood of their book selling well. I tend to stay away from stuff like that and choose my historical authors carefully. "Those types" will tend to take you much further from the truth. Not that there can't be well-written books about this debate, but I'm certain there are tons that are just speculation and not good history. I, too, have hated books I read in high school, but I choose to think that they either weren't presented properly, or I was too immature to appreciate them. So as an adult, I'm trying to be more open-minded to some of those. Some I've learned to appreciate and some I haven't, but at least I've given them a fair chance.